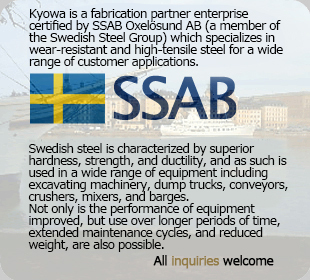 ●Hardox wear-resistant steel is available in grades from 400 to 550 and 600. A wide range of high-tensile steels such as Werdox700 (80kg steel) and Domex are also available. (e.g. bending, welding, edge preparation, machining). ※Feel free to inquire about items not listed above. Copyright©2010 Kyowakogyosho Co. Ltd All rights reserved.